Yesterday I had a “William Day.” He had a field trip with his preschool, a morning thing, and after it was done, we headed over to our little local zoo. He was off in the playground and I was observing him play while eating my lunch. The weather was chilly, and there weren’t that many people about. And then I heard a noise behind me, but I hadn’t sensed a presence. At least of the human persuasion. I turned to see what it was and … I guess this little fellow wanted to share in my lunch. Apparently, I’m not allowed to be without a critter nearby anywhere? When I was in the planning stages of our trip, and after I had initially contacted my two “online” friends, I finally took the time to work out the timing of our drive to Boyne City from Holland, and I started to feel a little anxious about it, because I knew William would be operating in delirium mode. For, you see, William no longer sleeps in the car. But I really wanted to somehow meet up with my second online friend, Sarah, and her son, Kellen. We would be this.close to each other. It seemed a shame to drive right on by… and, the irony of following that busy road painting truck once we were on the road, well, I was glad we had worked it out that we would be taking a break! Fortunately, Sarah apparently felt we were worth meeting, and she spent several hours researching parks along our route, asking her co-workers for input and ultimately finding an amazing park that none of our cumulative Google searches had revealed. Chalker Park had all sorts of bridges, swings, rooms, stairways, alcoves, lookouts, cut outs on paintings for cute pictures, rope ladders — ideal for kids (and adults!!) who had been cooped up in a car for way too long. There was even a huge painted dragon on one of the tall walls of the structure. Then, on top of all that, she hurried through her after work routine and drove out of her way to meet us there. When Sarah texted me that she had arrived at the park, I was busy watching the line of cars behind the road painting truck! When we finally arrived, I wasn’t confident that we had actually found the right place. I was expecting a slide and a patch of grass like we have here in California. This park was so huge that I couldn’t see anyone anywhere in the structure. There were a couple kids on the swings nearest the parking lot, and their moms were ambling around nearby, but none of them looked like Sarah or her son. I sent a desperate text to Sarah, “Where are you?? ?” and we started to leave the parking lot thinking there must be a smaller park down the road a bit, but William freaked out thinking we were leaving (instead of investigating), and after having been cooped up in the car for a couple of hours, he wanted OUT. So we pulled back into the parking lot and unloaded ourselves. Once in the structure, Sarah magically appeared from the yonder side and William was intent on running and climbing all over the place and seeing every bit of it that he could see. 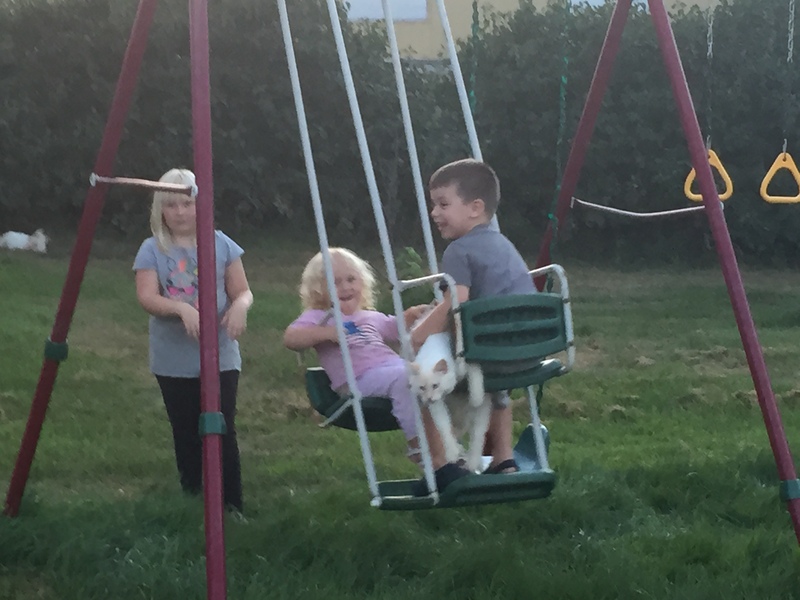 He did not want to “sit” in a swing or sit anywhere. He started an imaginary “Alice In Wonderland” scenario and wanted everyone to follow him while he chased an imaginary white rabbit to an imaginary tea party. I’m not certain what it was about this park that triggered that, maybe the maze-like hugeness of it? But it was quickly apparent to me that he wasn’t open to any other kind of game. Kellen, Sarah’s son, was intent on swinging on the swings and exploring the park in a more calm and solitary manner, and suggestions to either of the boys to play together, or even in the same area of the playground, were not being met with any sort of interest. To apply a cliche to it, it was a bit like herding cats in a roomful of rocking chairs. So, for awhile, Sarah and I were kind of like two pendulums, going opposite ways as we followed our boys, and then passing each other as we briefly chatted and then going the other way. It was interesting to see these two boys together. They are very different personalities, and I would hazard a guess to say they are actually opposite personality types. William is an extrovert, as well as an external processor (meaning that he processes what he’s thinking or feeling verbally) and, while he’s learning what’s OK to say or not say, he doesn’t always say things with intuition, tact or gentleness. 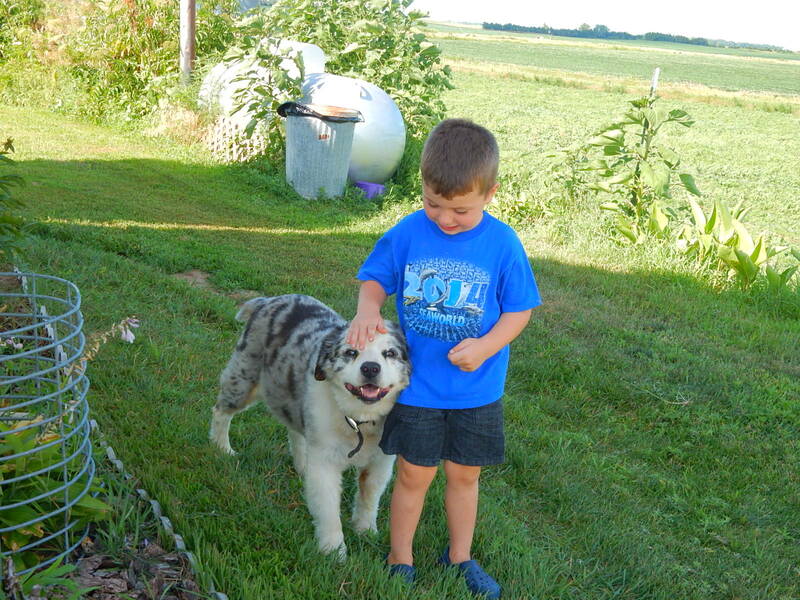 Kellen tends toward being an introvert (says one introvert about another), but he also has Childhood Apraxia of Speech. As a result, he leans toward doing his processing internally, articulating his needs only. After a bit of time at the playground, it seemed that Kellen started to feel overwhelmed, so he retreated to be alone, and began requesting an item that made him feel safe. Yet, after a bit, I noticed that he began to share his “safe” item with William, but wanted to maintain ownership — which, of course, makes total sense. I’m fairly sure that the sharing wasn’t being done on Kellen’s terms and, as a result, both William and Kellen were expressing frustration with each other and Sarah and I were doing our best to help them navigate through it. It had been about 30-45 minutes of running around at the playground, and so it was timely that Sarah happened to glance over her shoulder (or maybe she was looking for an escape route???) and spotted a place that advertised pizza. Ahhh, pizza, the great unifier! Alas, we had solidarity! Because who doesn’t love pizza? Plus, CONTAINMENT! We were all apparently a bit more “hangry” than we initially thought. We demolished a large pepperoni pizza (pizza!! ), breadsticks and salad, and we managed to fit in some adult chat time while the boys finally settled into a bit of a groove with each other. I was so impressed to finally meet Sarah and Kellen. It was a gift to watch mother & son together, and Kellen has a bond with his mommy that is beautiful to behold. Not surprising, because Sarah has one of the most beautiful hearts that I’ve ever seen in a person, and any person who has the opportunity to learn from her is blessed, indeed. I suppose I’m most astounded by the fact that, not only does Sarah face navigating the sea of being a voice and advocate for her son who is working hard to find his own voice through this disorder that frustrates the heck out of him, but she chooses to do so with understanding, kindness and by giving grace and forgiveness to those they encounter as they move along on their journey. I intuitively knew ahead of time that our visit might present some challenges with our boys, but I left feeling humbled and grateful for her patience, kindness & willingness to allow herself (and Kellen) to be vulnerable to us by allowing us some learning moments. When it was time for us to get on the road again, we took some pictures and gave each other several hugs before we left each other. Once again, I felt as if I were leaving behind another friend as we traveled on. I know Sarah is working to bring awareness to Childhood Apraxia of Speech, and so I’m linking her blog here, as well as a recent interview she did with Courtney Curtis of her local news station. For more information about childhood Apraxia, see Apraxia Kids. More About Last Month’s Vacation. In a previous post, I shared one of the funny moments that happened late in our vacation while it was still fresh in my mind. I also shared some tidbits of things we did while on vacation in William’s monthly post. I wanted to share an overview of all the things we did. 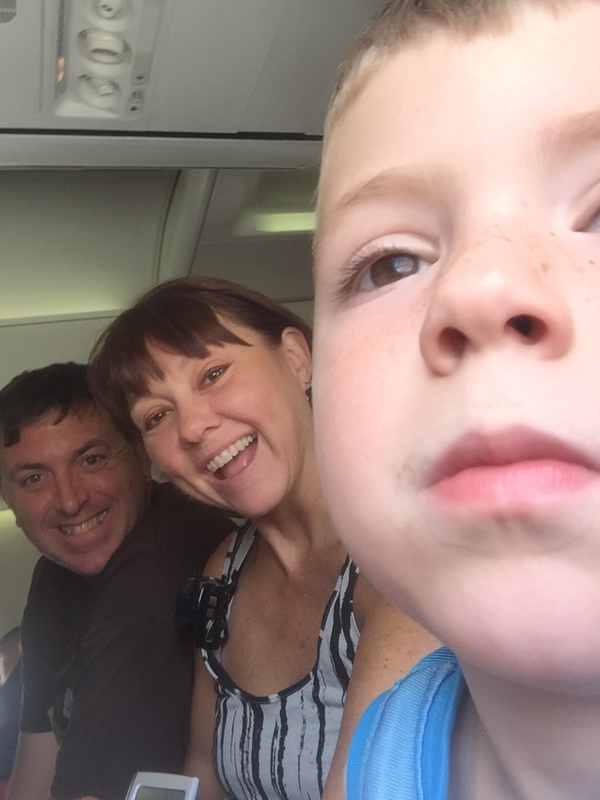 Our airline experiences this time were much better and on par with what I expect from Southwest Airlines. We managed to rack up $400 a person in complimentary vouchers from Southwest for the shoddy way they treated us last October, and those vouchers mostly funded our trip to San Francisco the end of May and our trip back to Nebraska. Sadly, since they did so well, that is the end of our free ride. Thank you, Southwest Airlines! 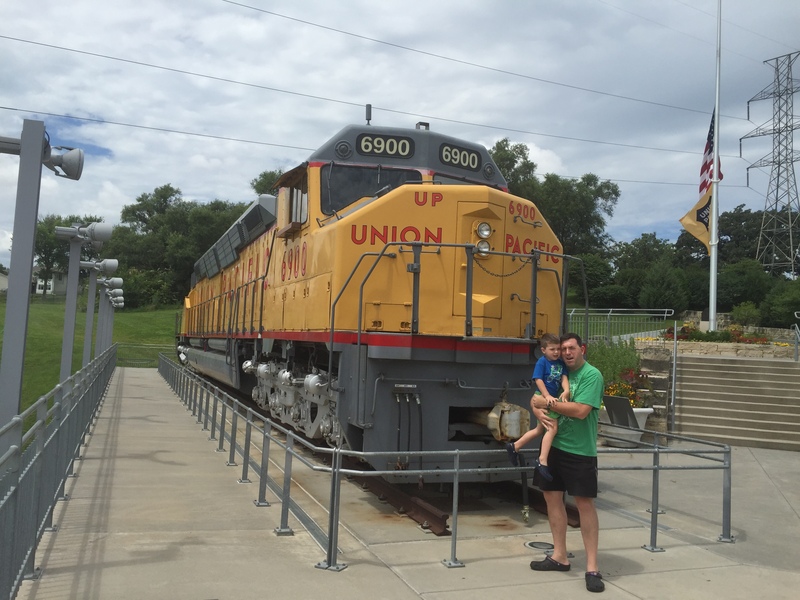 We stayed with my dear Aunt Marjorie (paternal side) for a few days while we visited the Omaha Zoo and Lauritzen Gardens again. We had visited those places last October, but our gardens visit got cut short due to a fast moving rainstorm. They have a model train garden that is quite amazing to watch, it’s so detailed! So we visited that again, and also walked up to see the two real-size, huge, famous engines they have on display. 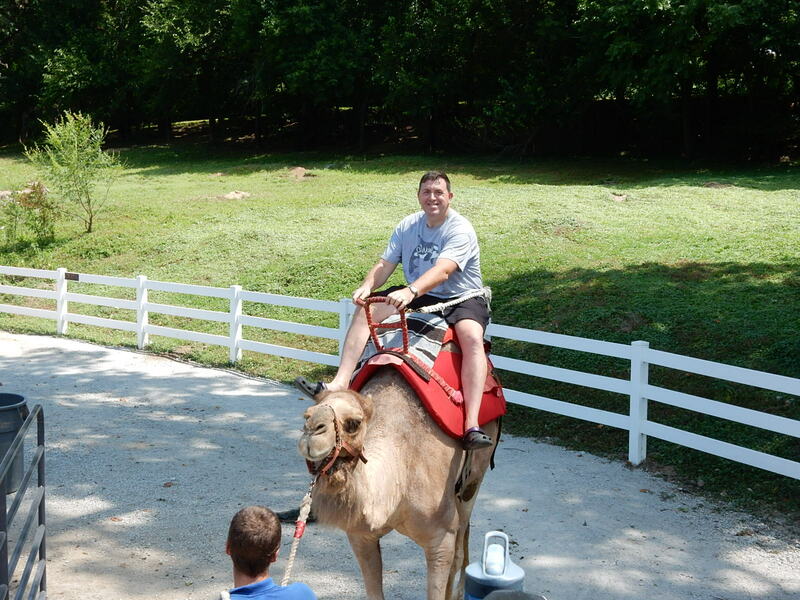 We were well pleased with our visit to the zoo last time, except they had ended the season of camel rides and their train wasn’t running the day we went. This trip it was overwhelmingly hot and humid. While the weather wasn’t necessarily a surprise, it was challenging for me (us?) because we’re used to California’s weather. Sadly, I wilted quicker than I expected in the heat. 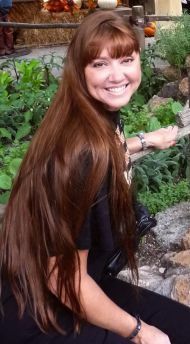 While at the zoo, We managed to meet up with some friends, a lady I know from an online Facebook group (and her family). Fortunately, they were willing companions for our agenda and didn’t protest when we suggested going and getting lunch. She had her two boys with her, the older of them shares a birthday with William. William LOVED meeting him and I loved hanging out with her. Tony pretty much gets along with anyone, and her husband was great to converse with. So, we kind of went to get some lunch and then just never stood back up again until it was time to leave. 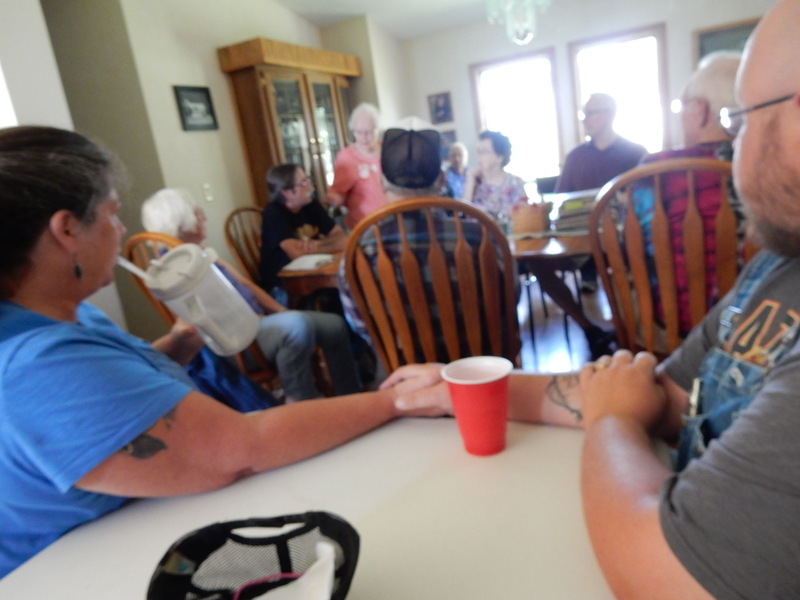 The timing of our trip was stipulated by a family gathering that happens annually the last Sunday of July in Albion, Nebraska. 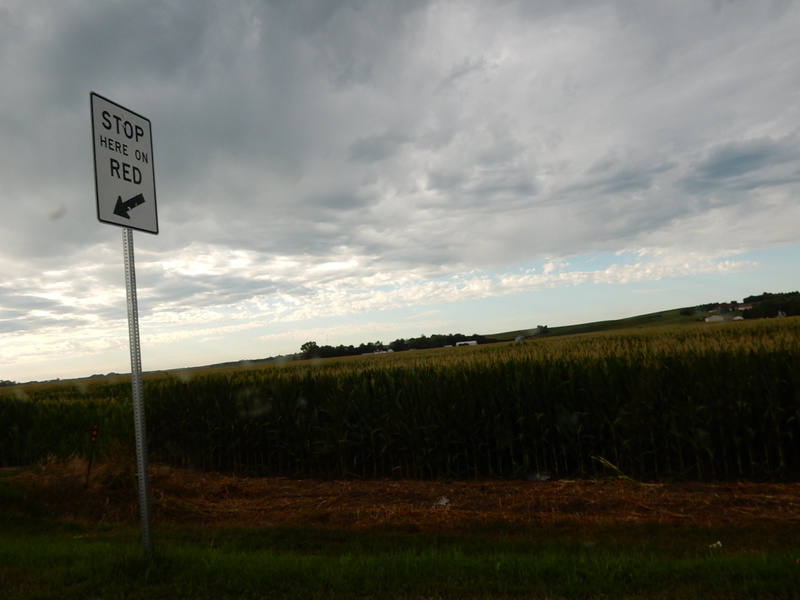 So, we did a road trip from Omaha to the middle of Nebraska, a two hour drive made longer by construction and ill-timed traffic lights on a timer in the middle of nowhere. My uncle (maternal side) graciously hosted us in their basement, which was blissfully cool and mostly comfortable. 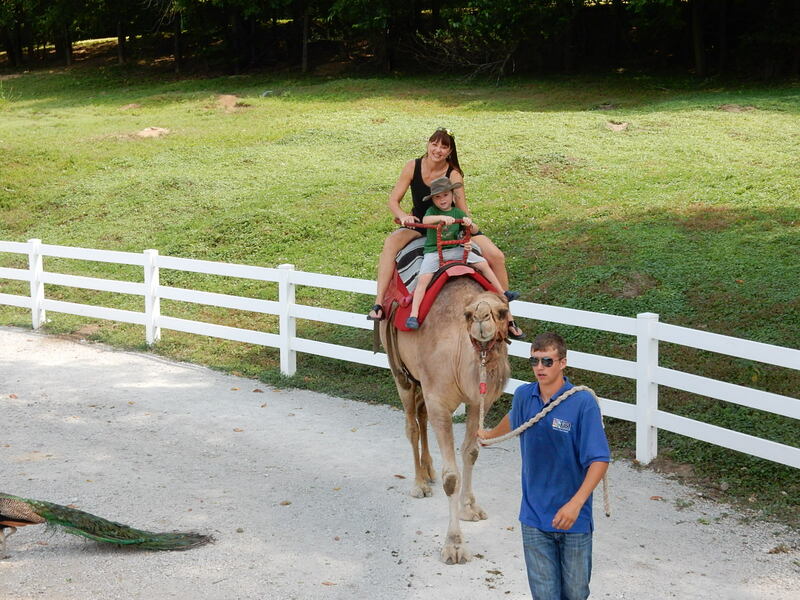 They are gracious hosts and very accommodating to quirky travelers. I highly recommend them. I just love staying with them on their farm. 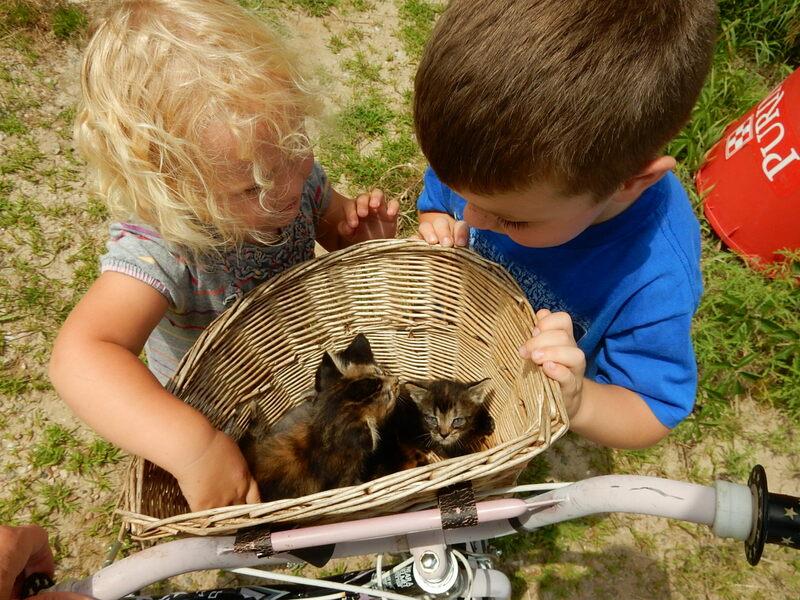 They have animals galore… cats and kittens(!! ), dogs, horses and ponies, goats, guineafowl, cows, and… I’m sure I’m missing naming a species here. Also, my cousin has two girls and William just loved playing with them! 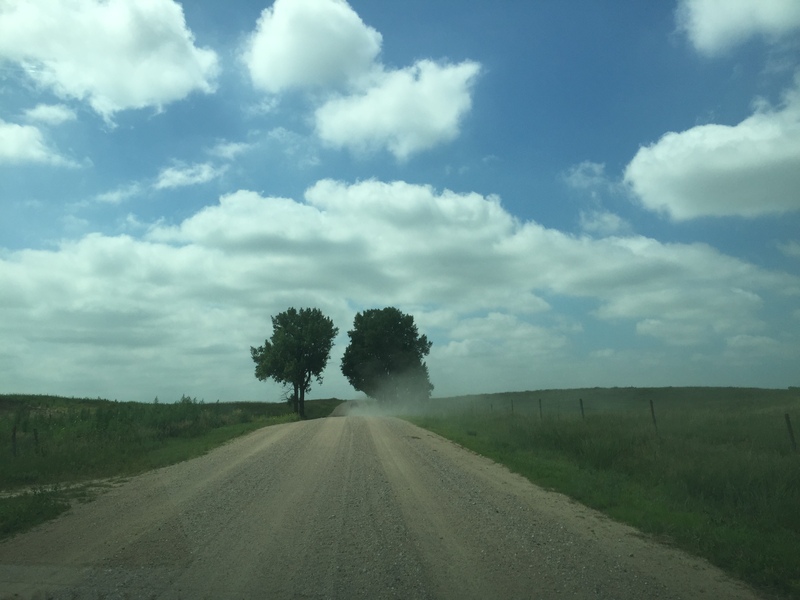 The drive to the family gathering was mostly on dirt roads, which William thought was fabulous thanks to the off-roading scenes in the Cars movie. It was made more entertaining for me by texting with my cousin, who was in the vehicle in front of us. She acted like a tour guide with such things like, “This is corn fields on your right and soybeans to your left. Upcoming to your right is a house where no one famous lives.” She would switch the types of fields appropriately. As we drove, we passed a farm that had a bunch of old buildings on it. There were a couple of churches, a sheriff building, and other things. It looked like a little Western town. I later learned from my uncle that the owner of that farm had a vision of building a little town, but he passed away and now his family doesn’t know what to do with the buildings. I guess his vision isn’t theirs. At the family gathering, the couple who hosted it are 2nd or 3rd cousins, once removed, to me, I think. I’m not really sure. Anyway, they have grandkids around William’s age, and while the kids weren’t in attendance, their toys were. William and my cousin’s girls had a fabulous time playing down in their basement. They have a pool table down there and William loved putting the balls in the holes and then listening to them rumble to the end. Best kid entertainment ever! I enjoyed seeing one of my cousins who I haven’t seen since he was 6 or 7 years old, and meeting his wife. There were also other distant relatives there and it was just an enjoyable relaxing time. The food was set up buffet style, entrees on one side of the kitchen island and various “salads” (the notion of salad is very different in the Midwest vs. California) on the other side. Also, desserts. The days went quickly (surely a sign of a good vacation?) and before we knew it, we were headed back to Omaha to stay with my Aunt Marjorie one last night and catch our flight the next morning. Now… where do we go next? I don’t know where the month of November has gone. I know they say that time seems to go faster as you get older, and then you throw a child into the mix and it really seems to fly. I really hate being a cliche. 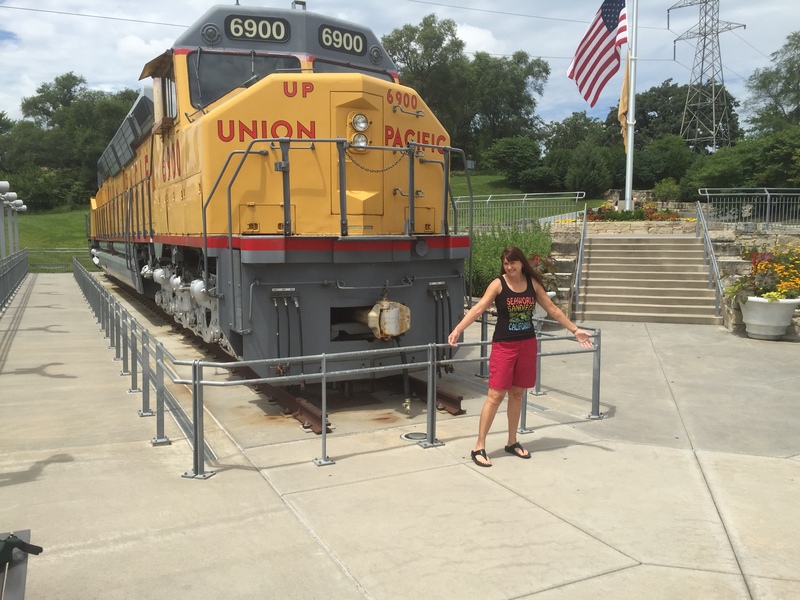 So, let’s catch up … late last month I was the recipient of a speeding ticket. It wasn’t an intentional thing on my part, it was more along the lines of me getting stuck in the middle of a huge group of cars who were doing 15 MPH under the speed limit, then, somehow, at the traffic light, the 5 cars ahead of me decided to turn left, leaving me the first in line and when the light turned green, my mind was on something else. Tony was right behind me and when the light turned green I must have reveled in my freedom. There wasn’t a real reason for me to speed, the lights are synched at that point all the way to the freeway, so no matter what speed I went, it wouldn’t have made a difference. There I was, way ahead of everyone, and I saw that motorcycle cop. Pretty sure it was the same guy who gave me my bicycle lane infringement ticket 5 years ago. I wonder if, when he saw me, in his head he chanted, “Winner, winner, Chicken Dinner!” I should have asked him that, huh? In fact, I’m gonna write a list of questions I want to ask an officer sometime… like, “Is it illegal for a motorcycle to use the double yellow lines between the carpool lane and the fast lane as a motorcycle lane, basically “splitting” lanes there?” and “Why does no one ever ticket the guy doing 40 MPH on the freeway?” You know, that sort of thing. I really am making a list, you know, because it’s these types of things I always forget to ask but really want to know when I’m faced with the officer who stands just behind your shoulder so you can’t really see him, while he’s asking to see your proof of registration and insurance and your hands are shaking because you’ve gotten caught breaking the law. In other automotive news, a month ago, I backed out of my garage, shifted out of reverse into 1st, and my neighbor backed into my car. It took me a couple seconds to figure out what happened… because how does one hit something if I was moving forward and there was nothing in front of me? Then I realized I hadn’t hit anything, someone had hit me. So weird. I’ve lived in this house for 8 years and never even come close to this happening. Proof, once again, that little cars are invisible to big SUVs. He said he’d replace the broken tail light, but I’m still waiting on it. Not without many updates on his part, because I told him I was OK with a used part because Mazda plastics have a reputation of fading. Plus, he has a couple small children, so if he’s anything like me, money is tight and every penny counts and used parts are generally less expensive. The thing is, I’m finding, I really just don’t care… it’s not like I ever look at my own tail light. I guess if it’s not replaced in another couple weeks, I’ll have to ask him about it. Thanksgiving is this week… even though we celebrated Thanksgiving early with Tony’s family this past weekend, since Steve and Marigold are moving eastward, we’ll be hosting a small “crockpot” Thanksgiving at our house on the real day this week. I’m looking forward to it. A three day work week is what I’m facing this week, and the first day of it (today) is almost over. Happy Thanskgiving, then, if I don’t get on here before then. 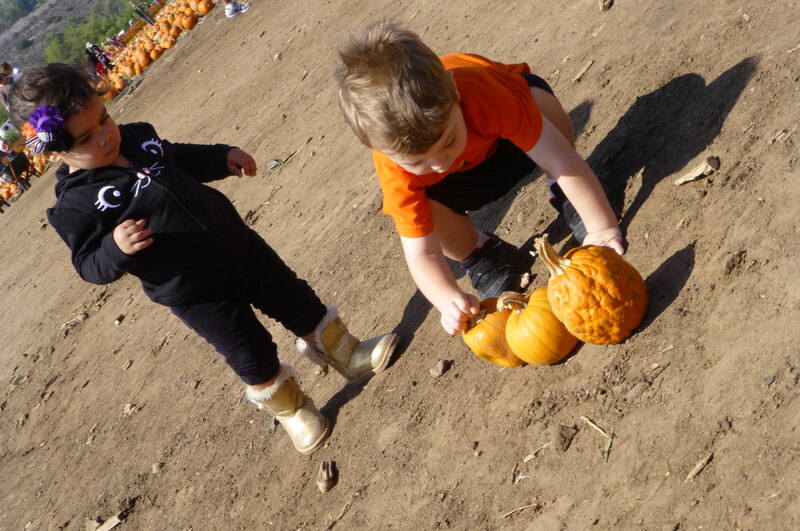 This weekend we went to the local farm where they grow seasonal items (Christmas trees, pumpkins, watermelons, etc.) as well as garden variety types of plants (kale, lettuces, carrots, etc.). 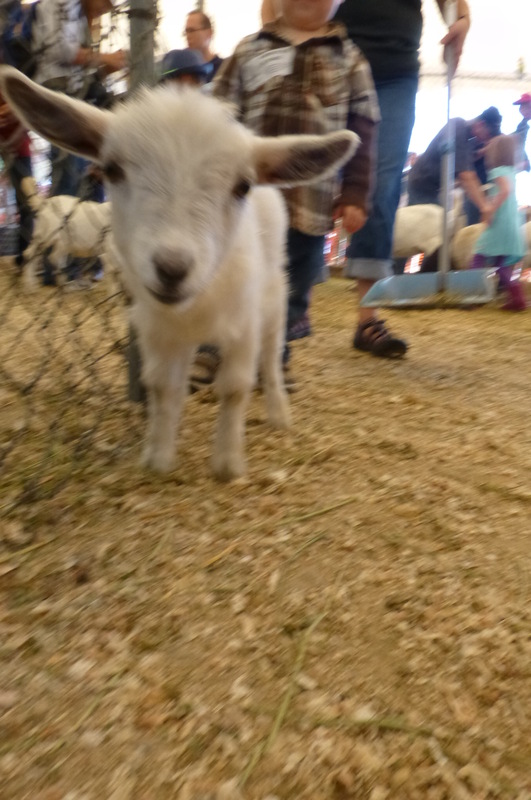 They have tractor pulled wagon rides, a corn maze, a hay bale maze, a pumpkin shootin’ cannon, as well as a petting zoo (lots of goats and sheep, as well as an imu or two). Usually it’s a dusty and dirty affair, and no matter how cold it is, it somehow always manages to feel about 10° hotter than it really is, and there’s always lots of people there and photobombs are pretty much guaranteed. 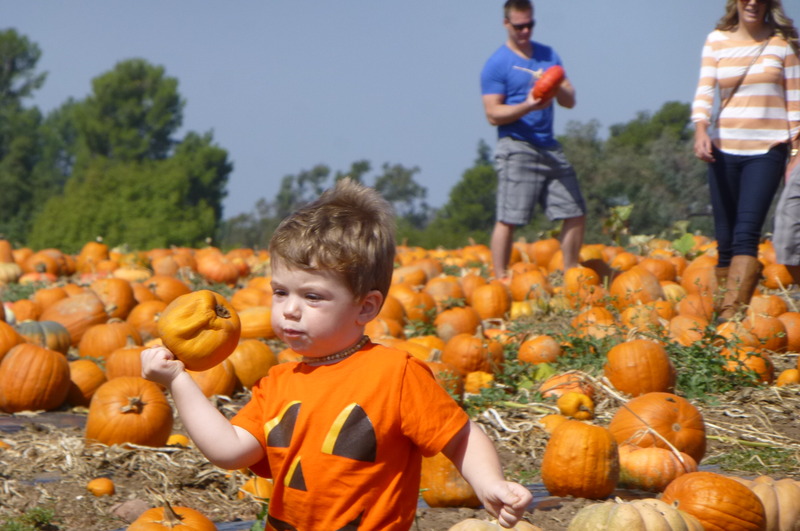 They claim all the pumpkins are organically grown on site, and there are boxes and piles of pumpkins, as well as the ones still attached to the vines. 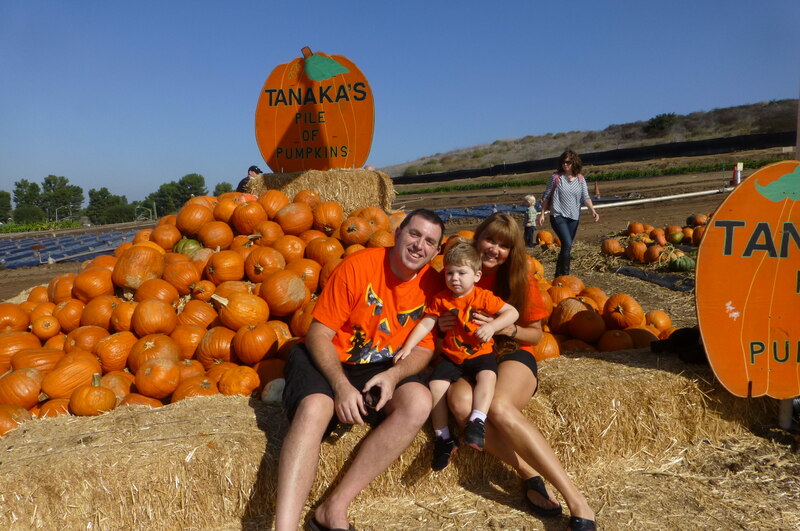 We were there for the experience, not to buy — we grew our own pumpkin this year at Tony’s parent’s house. 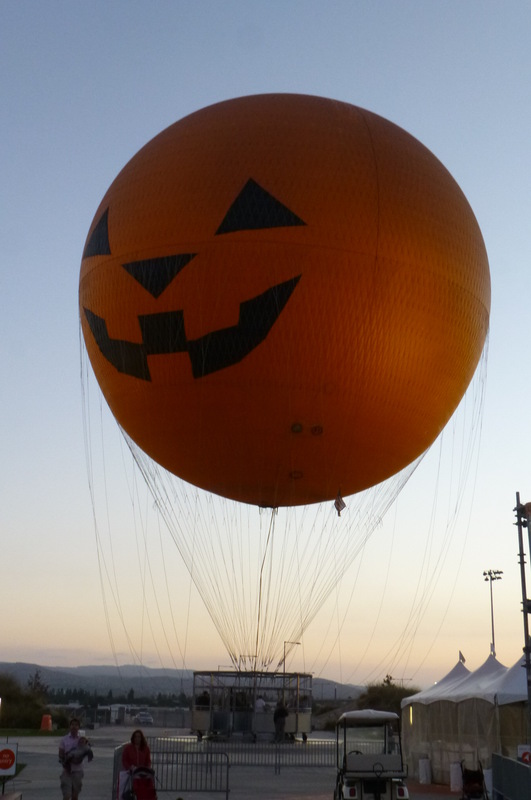 Since a pumpkin farm just isn’t enough pumpkin viewing for us, Sunday evening we headed out to the Orange County Great Park to see the “pumpkin” in the sky! They were sold out of tickets for the ride, but the carousel was there and William really, really, really liked riding on that. Unlike Tony, who turned an interesting shade of green after the first round on it. 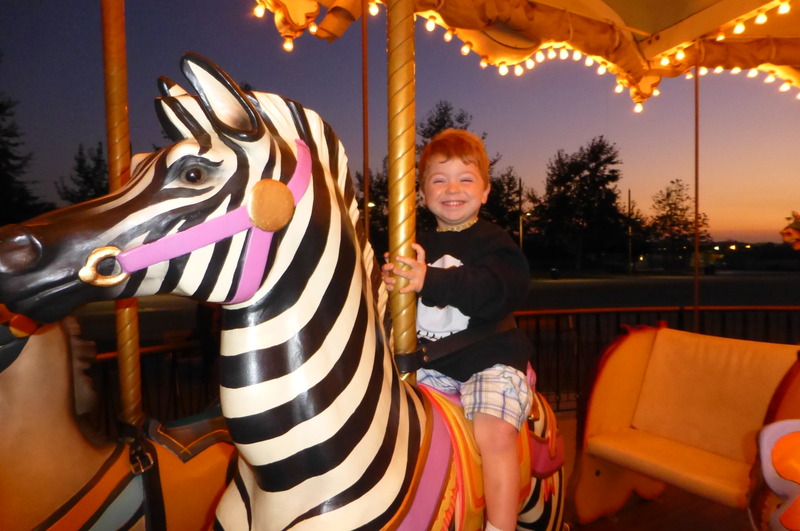 So, William first rode the “Biggest Horsey” then the Zebra!! and then the Ostrich. I was trying to pick the most unique of the animals to ride, and so I built up the excitement about riding the Ostrich. The Ostrich, William! Can you imagine!! An Ostrich! 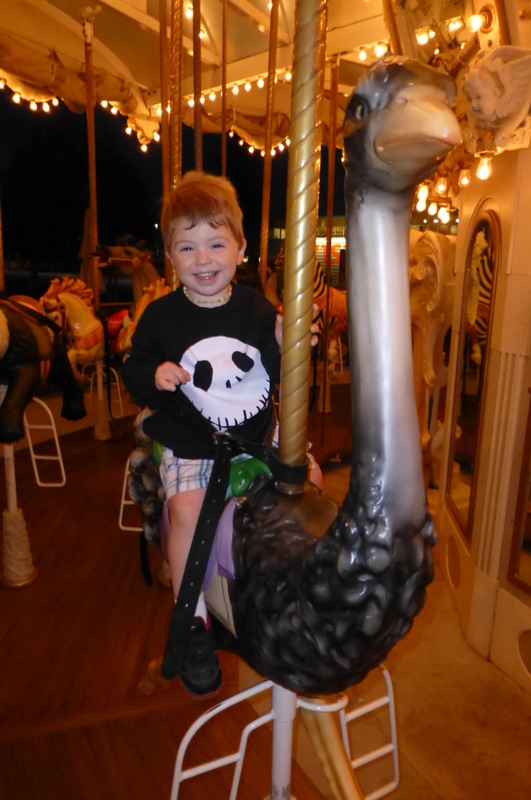 By the time the ride stopped, he was leaning off the Zebra and ready to go see this mystical and amazing creature, the Ostrich! His legs were stiff with excitement, his smile wide as can be. We got there, he took one look at it and said in a no-nonsense tone of voice, “It’s a duck.” No amount of persuasion tactics could change his mind. 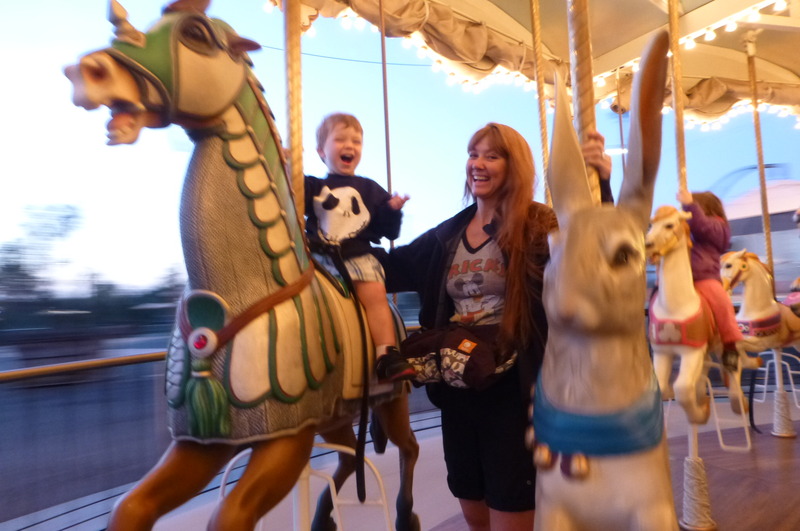 In his eyes, the thing was clearly a duck and, while he enjoyed it, he really would have rather ridden on the “Scary Cat!” Unfortunately, we closed the carousel party, and all the animals had to go to bed, so he only got to pet the scary cat as we exited the ride.